ADDIS ABABA, Ethiopia (AP) — Peace talks have stalled, a rebel commander is claiming big victories against the government, and Uganda is sending in more military troops and hardware. 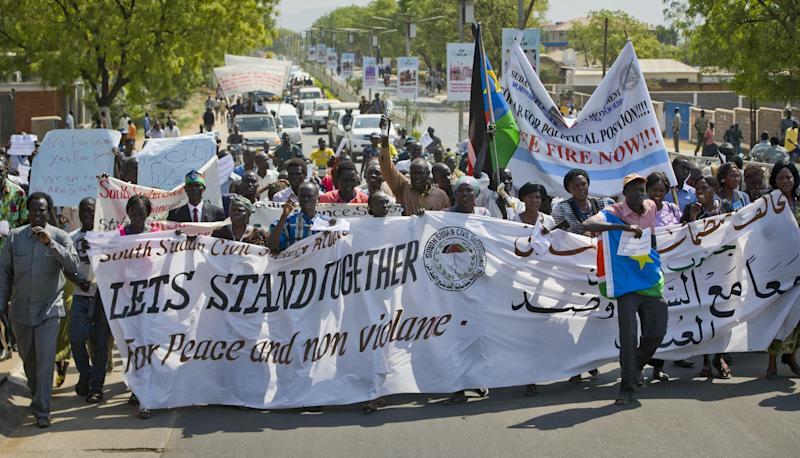 Even as several dozen people held a peace march in South Sudan's capital, Juba, on Wednesday, there is little evidence that the conflict is moving toward resolution more than three weeks after spiraling violence broke out in the country. Two officials in Ethiopia said Wednesday that peace talks have stalled over the issue of political prisoners. The special envoy of a bloc of East African countries known as IGAD has flown to Juba, the capital of South Sudan, to speak about political detainees. A political dispute that broke out in violence on Dec. 15 has since turned to ethnic-based attacks. President Salva Kiir, an ethnic Dinka, says his former vice president, Riek Machar, an ethnic Nuer, tried to launch a coup. 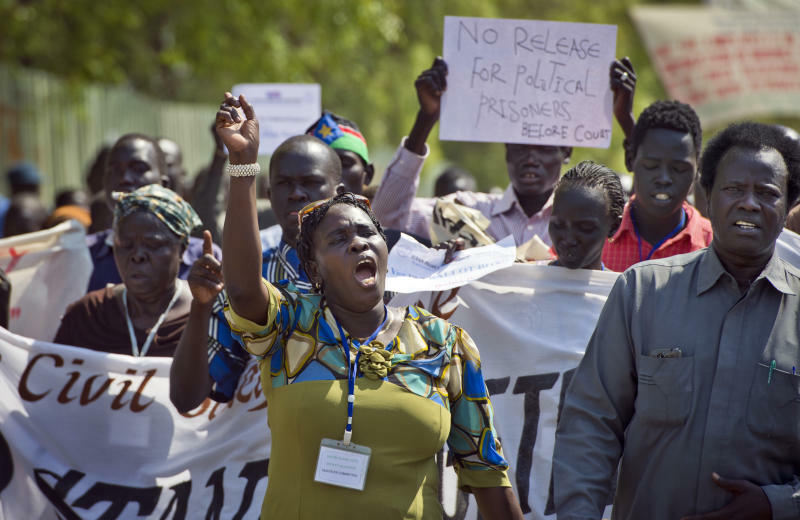 Machar denies the accusation and is demanding the release of 11 high-level detainees. Kiir has said they will be released according to the country's judicial process. A spokesman for the Machar side in Ethiopia, Brig. Gen. Lul Raui Kong, a member of South Sudan's military who has defected, spoke in an interview Wednesday of major military battles between the country's army and renegade troops. Kong said that in the battle for Bor, the state capital of Jonglei some 120 kilometers (70 miles) north of Juba, rebel fighters have destroyed two T-72 tanks and four military trucks. Kong said his side has killed dozens of government soldiers, including a general, outside Bor; there was no way to verify the claim. Kong said his side has benefited from major defections in the states of Central Equatorial, Upper Nile and Jonglei. Uganda, Kong said, has sent in 1,200 troops to secure installations like the airport and state house. He also said Ugandan military aircraft have bombed several rebel-held positions. Uganda says its deployment of more troops and military hardware to Juba this week came at the request of Kiir. Ugandan military spokesman Lt. Col. Paddy Ankunda said Wednesday that reinforcements were sent in Monday and Tuesday in order "to plug security gaps." He denied the Ugandans were actively involved in combat. Ugandan President Yoweri Museveni is a strong ally of Kiir's, and the neighboring countries have built a bond that goes back to South Sudan's Uganda-backed armed struggle for independence from Sudan. Museveni recently warned Machar that East African countries would unite to "defeat" him militarily if he does not agree to attend peace talks. Some analysts say Museveni distrusts Machar as a potential leader of South Sudan. The distrust stems in part from Machar's alleged links with the Ugandan warlord Joseph Kony, who once operated in jungles that now fall in South Sudan's territory and with the alleged support of Sudan's government. In 2005, as South Sudan moved closer to autonomy, Kony agreed to negotiate with Uganda's government under the mediation of Machar. Those talks failed, and in late 2008 Kony and his top commanders fled their forested base in eastern Congo hours before Uganda's military moved in to launch an aerial assault. Some in Uganda's military believe Machar informed Kony of the impending attack. "Machar is an independent actor whose shifting loyalties, especially his ability to work with Khartoum, probably unnerves Museveni who sees his assent to power in South Sudan as riskier for Ugandan interests," said Angelo Izama, a Ugandan analyst who runs a regional security think tank called Fanaka Kwawote. "Even now I suspect he considers Machar as a proxy for Khartoum. ... Any situation that gives Machar advantage may be considered a danger to Museveni and a direct threat to Uganda."